Spring beets have recently arrived at our fruit and veggie shop; they looked so pretty the other day that I couldn’t pass up buying a bunch of three. I could have made this salad or borshch, but I was in the mood to try a new recipe with beets as the star ingredient. A short search turned up this recipe, which inspired me and gave me a base upon which to elaborate. 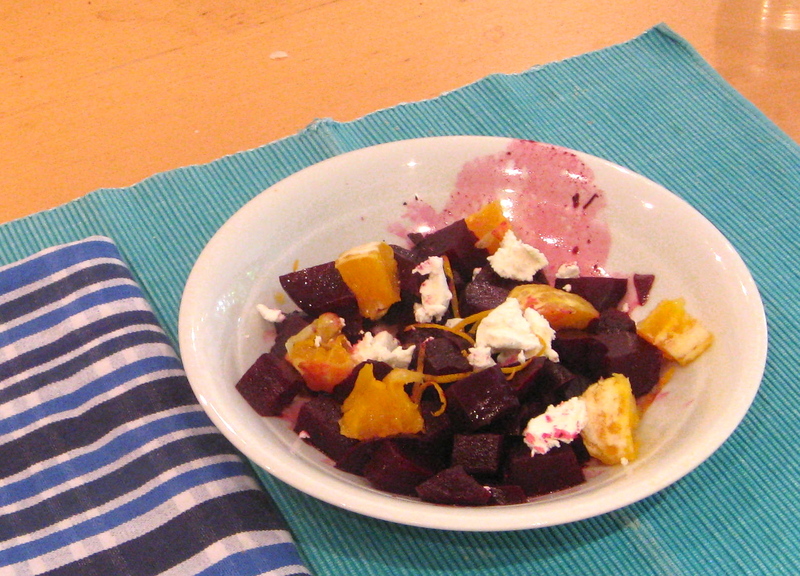 This dish has natural, earthy sweetness from the beets, citrus sweetness from the oranges, fresh tang from the goat cheese, and a bit of acidity from the balsamic glaze. It is fresh, springy, and satisfying. You’ll need a bit more than an hour to roast the beets, but other than that it is a fast and easy recipe. I recommend only adding goat cheese right before you plan to eat it. Two Years Ago: Videos Galore! Preheat the oven to 400F (200C). Line a baking pan with aluminum foil. Wash the beets, then put them in the foil-lined pan and rub them with olive oil and salt. Cover them with another piece of foil and pinch everything closed to make a little packet. Roast the beets in the oven for 1 hour 20 minutes, or until they are soft when you pierce them with a knife. When the beets are cooked, remove them from the oven and foil and let them cool. While they are cooling, heat the balsamic vinegar and sugar in a small pan on high heat until it reduces into a syrupy consistency. When the beets are cool, peel off the skins and chop them into bite-sized pieces. Combine the beets and balsamic glaze in a bowl, then add the orange zest, orange cubes, salt, and pepper. Toss and serve with crumbled goat cheese on top. This entry was posted in climate, food, health, pictures, recipes on 31.05.2013 by taplatt.